Some are relatively minor changes. The real Geeta Phogat had shoulder length hair during the Commonwealth Games. The Geeta Phogat on-screen has symbolically chopped it off. Chalega. But what about the coach on-screen who is depicted as a complete duffer, an obstacle in Geeta’s path? The real coach was actually a competent fellow and there was no ego clash. What’s more, Geeta Phogat did not fail in all her international outings. And in the final match at the Commonwealth Games 2010, she easily overpowered her Australian opponent 1-0, 7-0 to clinch the gold. But the poor coach had to become a villain, so that Mahavir Phogat aka Aamir Khan could play the hero. Well, you might say - don’t crib about that. Isn’t it great that an actor of his stature picked up a story like this and made such a great film out of it? It’s all about empowering women and it’s about a sport other than cricket. Bhai thoda bhool-chook maaf. How does this compare with biopics made in Hollywood? Well, it turns out the accuracy level is as as 41% low in a movie like The Imitation Game (which I quite enjoyed) but a respectable 89.9% in Bridge of Spies (also a great movie). 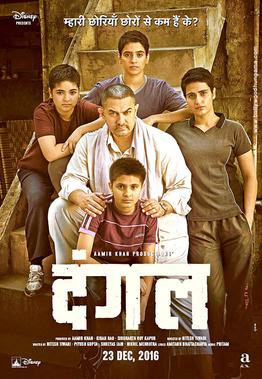 But none of these films is blockbuster mass-market variety, which is what Dangal has achieved. So I guess in the movie world - anything goes. As long as the larger purpose is served. The real Milkha Singh never looked back during that fateful race nor was Mary Kom in the ring fighting for the world championship while her son was fighting for his life. But the audience lapped it up right - toh phir this is the formula that works. Facts must wrestle with fiction and ultimately... the stronger narrative prevails. Now if only I could use that trick in my next book. And turn some boring young fogey of an entrepreneur into Superman!